How I Went from Zero to 10,000 in 41 Days! In July I met snake expert and YouTube Vlogger Brian Barczyk (900,000 Subscribers) at a Reptile Show. We hit it off and he invited me to visit him in Michigan. The very next week I was there, pen and paper in hand, learning cap on! In September I visited him again this time building my new friend a pond (go figure) for his 3 legged alligator RJ, another one for his home and I even brought him a giant alligator snapping turtle he named Bowser. 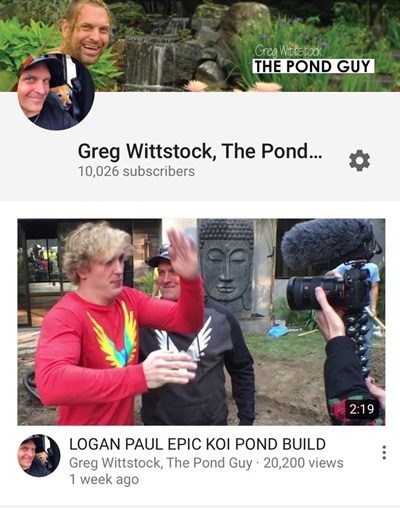 In October Vlogger extraordinaire Logan Paul (14,000,000 Subscribers) mentioned on his Vlog that he’d love a koi pond at his new LA Mansion. Within days I was on a plane visiting him to design him one! I reached out to Green Industry Vloggers like Stanley Genadek (100,000 Subscribers) Keith Kalfas (45,000 Subscribers) and Blake Albertson (18,000 Subscribers) inviting them to join me at Logan’s while picking their brains the whole time on how exactly they did what they did! I’ve reached this milestone by shifting a talented but stuck in a rut Teammate Flavio Ramirez from Product Marketing to my full time Vlog editor. I’ve hired a new passionate Videographer Luke Toby Newman to tell the story of life at Aquascape every week. I’ve listened and learned from the much wiser Marketing duo of Aveline Valvano Hauser and Jennifer Zuri who have patiently listened to my vision and are building the back end metrics to properly optimize our content to make sure the world actually sees what we produce. Finally, I let long time Aquascape Videographer Tony Alcala and his assistant Lisa McGinnis pick out my Vlogging camera and even a Drone (that still scares me!) to record beautiful ponds, cool customers and the neat places I plan on visiting as I attack a 365 Day Vlogging strategy in 2018! “The easiest way to succeed in life is to find someone succeeding doing what you want to do and do and do what they did! I’M DOING THAT! And I’m doing what I’ve always done as well by surrounding myself with an incredible and talented team who supports me on this journey! I truly love what I do and the people I get a chance everyday to do it with! Please join me on this journey to share my passion for ponds, turtles and even life with as many people as possible in 2018! Newer Post Are You Entertaining or Just Being an A**hole?! Older Post Logan Paul the Wonder Kid!